sailboat. : The Week I Gave Up Hot Drinks. The MoneySuperMarket One Week Energy Challenge is all about highlighting how we take prized possessions for granted and what happens when we don’t have those items anymore if, for example, energy bills are too high and sacrifices have to be made. My kettle and I have been in a long term relationship for many years. We've had a few ups and downs, i.e. when I had to give up coffee (headaches) and then again when I chose to stop drinking tea (only really liked it with approximately one tonne of sugar in each cup), but we've always made it through, namely with copious cups of hot lemon & honey and, of course, the pure joy that is a comforting mug of hot chocolate. Despite this I thought going without it for a week would be easy-peasy. Oh how wrong I was. A quick Google has told me that it costs around 1p to boil a half full kettle. If I were being really energy efficient I would just boil a cup every time, I haven't been doing that, but I will do from now on. Pre-challenge I was probably boiling the kettle five or six times a day, so that's 6p per day, 42p per week, and almost £22 per year. It doesn't sound like much, but you know, that's a few books or an extra donation to a good cause every year. I also recognise how privileged I am to not have to think about that 6p a day too much in the first place. Thank you to MoneySuperMarket for setting this challenge for me, it's really got me thinking and I now appreciate how small things add up over a relatively short period of time much more clearly. The thought of comparing energy prices (which you can do here) admittedly does make my eyes glaze over somewhat, but saving a few pennies here and there to do some good with sounds better than those few pennies lining the pockets of a big energy company. And so as I sit here writing this with a cup of hot lemon & honey next to me, I will now always remember to appreciate this little luxury even more than I did before. Have you ever given up something you love for a week or perhaps even longer? Did it change how you felt about it? - This post is in collaboration with MoneySuperMarket, but all thoughts are, of course, my own. Oh gosh I've never actually thought about this before! It's so automatic I barely think about filling the kettle to full. I agree, it's so easy to just fill it up completely when you're on auto-pilot! 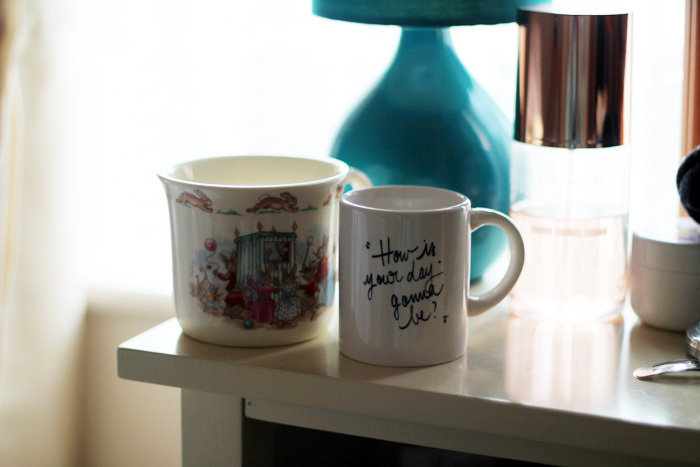 Love your Bunnykins mug, I still have the bowl from that set. Tbh I never think about how much energy I waste when boiling the kettle- which is odd because I'm so eco friendly with everything else I do around the house. Maybe I need to stop just filling the kettle so I can just flick it on whenever I want a tea during the day and take the time to fill it up every time I want some tea. I had no idea it cost 'that much' to fill half a kettle. I oddly enough never boil more water than enough for one cup (unless I have guests), simply because I don't like leaving the water in the kettle. I prefer "fresh" water in the kettle for my hot drinks (I'm weird like that). Anyway, cool post made me aware at least! OMG. Do you know how often I boil the jug, walk away and get distracted, then boil it again (repeat several times) before I actually make the tea? I have a very similar mug! Same style, etc, just slightly taller with a different rabbit illustration. So crazy considering I'm worlds away from you! I don't think I could give up coffee for even one day! Well done Jennie! Everytime I boil the kettle I think about this! I doubt I can give up on my cups of tea though. You're brave. I could never give it up.